This is part of Categories for Programmers. Previously: Simple Algebraic Data Types. See the Table of Contents. 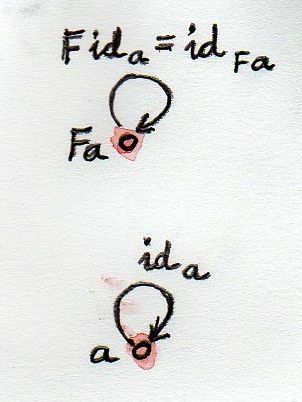 Here, ida is the identity at the object a, and idF a the identity at F a. Note that these conditions make functors much more restrictive than regular functions. 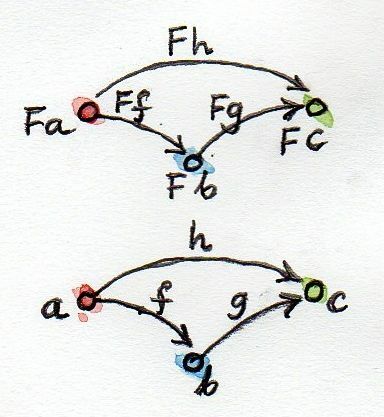 Functors must preserve the structure of a category. If you picture a category as a collection of objects held together by a network of morphisms, a functor is not allowed to introduce any tears into this fabric. It may smash objects together, it may glue multiple morphisms into one, but it may never break things apart. This no-tearing constraint is similar to the continuity condition you might know from calculus. In this sense functors are “continuous” (although there exists an even more restrictive notion of continuity for functors). Just like functions, functors may do both collapsing and embedding. The embedding aspect is more prominent when the source category is much smaller than the target category. In the extreme, the source can be the trivial singleton category — a category with one object and one morphism (the identity). A functor from the singleton category to any other category simply selects an object in that category. This is fully analogous to the property of morphisms from singleton sets selecting elements in target sets. The maximally collapsing functor is called the constant functor Δc. It maps every object in the source category to one selected object c in the target category. It also maps every morphism in the source category to the identity morphism idc. It acts like a black hole, compacting everything into one singularity. We’ll see more of this functor when we discuss limits and colimits. Let’s get down to earth and talk about programming. We have our category of types and functions. We can talk about functors that map this category into itself — such functors are called endofunctors. So what’s an endofunctor in the category of types? First of all, it maps types to types. We’ve seen examples of such mappings, maybe without realizing that they were just that. I’m talking about definitions of types that were parameterized by other types. Let’s see a few examples. To show that the type constructor Maybe together with the function fmap form a functor, we have to prove that fmap preserves identity and composition. These are called “the functor laws,” but they simply ensure the preservation of the structure of the category. This is definitely not a valid transformation, and it will not produce the same result. Despite that, the C++ compiler will try to use equational reasoning if you implement square as a macro, with disastrous results. By the way, the Functor class, as well as its instance definitions for a lot of simple data types, including Maybe, are part of the standard Prelude library. This definition works, but only because the second argument of fmap selects the overload. It totally ignores the more generic definition of fmap. Most C++ containers are functors by virtue of implementing iterators that can be passed to std::transform, which is the more primitive cousin of fmap. Unfortunately, the simplicity of a functor is lost under the usual clutter of iterators and temporaries (see the implementation of fmap above). I’m happy to say that the new proposed C++ range library makes the functorial nature of ranges much more pronounced. This combination of the type constructor (->) r with the above implementation of fmap is called the reader functor. Despite its weirdness, the Const functor plays an important role in many constructions. In category theory, it’s a special case of the Δc functor I mentioned earlier — the endo-functor case of a black hole. We’ll be seeing more of it it in the future. Finally, that function is applied to mis. 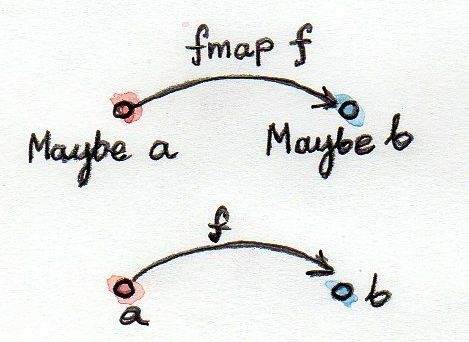 So the composition of two functors is a functor whose fmap is the composition of the corresponding fmaps. 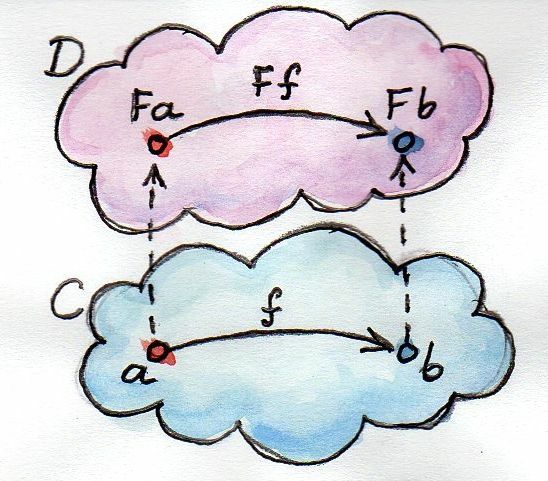 Going back to category theory: It’s pretty obvious that functor composition is associative (the mapping of objects is associative, and the mapping of morphisms is associative). And there is also a trivial identity functor in every category: it maps every object to itself, and every morphism to itself. So functors have all the same properties as morphisms in some category. But what category would that be? It would have to be a category in which objects are categories and morphisms are functors. It’s a category of categories. But a category of all categories would have to include itself, and we would get into the same kinds of paradoxes that made the set of all sets impossible. There is, however, a category of all small categories called Cat (which is big, so it can’t be a member of itself). A small category is one in which objects form a set, as opposed to something larger than a set. Mind you, in category theory, even an infinite uncountable set is considered “small.” I thought I’d mention these things because I find it pretty amazing that we can recognize the same structures repeating themselves at many levels of abstraction. We’ll see later that functors form categories as well. Implement the reader functor in your second favorite language (the first being Haskell, of course). Gershom Bazerman is kind enough to keep reviewing these posts. I’m grateful for his patience and insight. To me, what functor does sounds roughly like “it defines a category on objects of D with morphisms from C”. Or, otherwise, D is assumed to be isomorphic to C.
@Nikolai: An isomorphism is invertible, a general functor isn’t. It can map multiple objects to one object and multiple morphisms to one morphism. You can’t invert such a mapping. A collapsing or an embedding mapping is not invertible. Yes, you’re right of course. Isomorphism is a too strict statement here. What I was trying to say is that not any two categories C and D can be mapped with a functor, for example, F C can contain morphisms that do not exist in D, right? Actually, any two non-empty categories can be mapped using the Const functor. I’m not sure what the distinction between “necessary condition” and “part of definition.” A functor is a mapping of objects and morphisms. Every object and every morphism from C must be mapped. But it doesn’t matter whether all objects and morphism in D are covered or not. It’s the same situation as with functions: they don’t have to be “onto” (surjective) or injective (have a look at the last section of Products and Coproducts). After I’ve finished reading it’s pretty clear from the text what a functor is, so it probably makes no sense to explain now what I was confused with after the first paragraph. Maybe I can formulate it as “a more formal definition sometimes would be nice to have, in my opinion”. It helps to get a feeling what you’re talking about in what follows. Anyway, your posts are just enjoyable. Thanks for that. I am taking a course in category theory and if I have any regrets right now it would be not finding your blog earlier. If I am able to pass the final report it will be hugely thanks to these and your older posts – the Haskell connection is making everything so much easier to understand. Have you considered attaching a Bitcoin address or something for people like me who want to donate as a thank you for the work so far? On the remark that the C++ version of the Const functor is perhaps simpler: would it maybe become more complicated if _v was declared const, and c was passed to fmap by const reference, rather than by copy (and perhaps other stuff like that that one has to worry about that starts to clutter declarations)? Excellent work – thank you. I’ve chuckled a bit on this one: “Let’s call the argument type r and the result type a”. Wouldn’t it be cleared to the reader to name the argument type “a”, and the result type “r”? You know, just use the initial letter of each rather than using the initial letter of the other one :). First, Bartosz, let me extend a great thanks for your truly excellent tutorials. I have read a good number of articles and texts, but your series draws connections between category theory and computer science better than any other. There is a proof above showing the preservation of identity. The just x case seems to end prematurely. Forgive me if I am picking a nit, but this is often where I get stuck. Specifically, on what constitutes an adequate proof (honestly I often have difficulty identifying what we are even trying to prove when it comes to category theory). I hate to think of the last step (the one I added) as ‘obvious’ since many steps are seemingly obvious and it is the correct sequence of seemingly obvious steps that makes it a proof. On the other hand, the step I added may not be needed, but then I am confused about how the result (without the extra step) actually proves that fmap id = id. Thank you again for the excellent tutorials. @jjj: You’re right. Since I did this last step explicitly in the Nothing case, there is no good justification to skip it in the Just case. I fixed it. Thanks for paying attention. not sure whether my inductive reasoning is correct , can you check? (fmap g) . (fmap f) = fmap g (fmap f x:xs) = fmap g (f x: fmap xs) = g ( f x) : (fmap g(fmap f xs)) = (g.f)x : tail which has been proved by induction? You also have to prove that composition works for an empty list. It also makes sense to use the equational reasoning style, where each step is explicitly justified by one of your assumptions. Outstanding stuff, Bartosz. I was just talking with someone the other day, opining about the lack of a truly accessible introduction to category theory (a la Linear Algebra Done Right, or Spivak’s Calculus). Yours is the best I’ve found so far. Thanks! Are there any answers to the exercises posted somewhere? It’s really difficult too see if my solutions are correct. “type functions” are “function types” (under “The Reader Functor”). Is that so? (->) is a type function: a function that acts on types and produces a type. When you apply it to two types, a and b, you get a function type, a->b. In other words, you produce the type of a function that takes a value of type a as an argument and returns a value of type b.
isn’t there a typo? I mean, why definition of fmap suddenly became definition of id? The stuff between braces explains what definition I’m using. Does that mean that a, b, Maybe a, Maybe b, f, and fmap f are all part of the same category? I’m really confused by how you move from this “endofunctor” to the definition of Maybe as a functor. Yes, they are all part of the same category. a, b, Maybe a, Maybe b are types, so they are objects in this category. f and fmap f are functions, so they are morphisms in this category. I did not manage to use your C++ implementation of fmap without specifying both template arguments. Am I missing something? Thanks for this amazing book. I’m currently on the functors chapter and am a bit confused about something. Shouldn’t the Haskell Functor class also have a x -> f x function that maps objects? You’re making a level slip–a common misunderstanding in category theory. A functor in Haskell maps types to types, e.g. Int type is mapped to a list type, [Int]. That is different from mapping elements of Int (individual integers, like 43) to individual lists (like [1, 2, 3]). Don’t meant to be picky here but I’d really like to have the Haskell as a category concept absolutely clear, since it’s used on so many examples all over the book. So is it correct to say that arrows in Haskell correspond to actual functions (not function types), and objects correspond to types, and since a functor in category theory is both a map from arrows to arrows and from objects to objects, the arrow map corresponds to a particular implementation of fmap, and the object map corresponds to a particular implementation of the Functor type class? I think I was confused becuase Monad does have a unit that maps x to m x, but I guess that’s for a different reason. You mean “morphisms” in Haskell, right? Because “arrow” in this context is ambiguous. It could mean ->, as in in a->b, in which case it corresponds to a function type. Yes, a morphism corresponds to a Haskell function. A functor is a combination of a type constructor and a particular implementation of fmap specified in its instance declaration. xIn Haskell only injective functors such as Maybe, Reade,  and totally collapsing Const functor have been described. But generally, in cathegory theory, there may be “partially” collapsing functors too. And the corresponding function (category morphisms). The functor laws will be true if we only consider the functions that the first item of the resulting pair counts only from the first item of the parameter. How to define such a Functor? This functor is defined only for some objects and some morphisms, so actually from the subcategory. So it’s not an endofunctor. But I think it should not be a problem. I could not find an example of a parially collapsing functor on the whole Hask category, could you please give such an example? When i was young, i was a good math’s and programming.But no enough explanations in cath theory, so i go into engineering of electronics and computer.And after graduate as engineer a new study in math-informatics.. After all these years , this article make suddenly clear, many questions in type and cath theories.Thanks .